If you store any personal information on a computer, smartphone, or web service, your data is at risk from two massive computer security exploits: Spectre and Meltdown. Technology firms are currently rushing to fix these two security flaws identified in computer chips. What makes Meltdown and Spectre especially sinister, aside from their James Bondian names, is that they affect your computer at the hardware level: the processors inside your devices. And these flaws exist not because of a bug in computer software design, but because of a feature in computer hardware that has been around since 1995. Consumers expect computers to get faster and faster each year. The new Apple TV isn’t just slightly faster, it’s remarkably faster. The fastest, most responsive stylus experience ever has been built. To satisfy this insatiable need for increasingly fast computers, chip developers added a function to processors called Speculative Execution. Processors are the chips inside a computer that allow it to perform hundreds of billions of calculations per second. Think of it as the computer’s brain. Speculative execution allows the computer to guess what you might do next and perform necessary calculations for those possible outcomes, keeping one step ahead of you. Imagine if your favorite coffee shop began preparing your favorite orders ahead of time. Your coffee is ready for you before you ask for it and you’re in and out of the shop faster than if you were to order from scratch every time. Those unused, pre-made orders… they get trashed. That’s the problem with speculative execution— all those junked orders, they’re not really protected. Someone sorting through those trashed orders might gain brief unauthorized access to your name or your daily order. 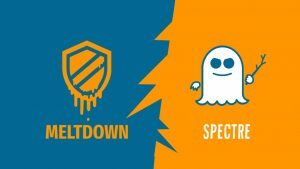 Meltdown and Spectre exploit this feature by using malicious code that tricks a computer into speculatively loading information it wouldn’t normally have access to. And you — or an antivirus program — wouldn’t necessarily know that someone is snooping on your data since Meltdown and Spectre are exploiting a normal function of your computer’s processor. These exploits could allow a hacker to snoop on data on a computer or a smartphone, or even in the cloud. Spectre allows a malicious program or code to trick other applications, using a shared processor, into loading sensitive information that it would normally keep secure and separate between the programs. Meltdown works slightly differently — instead of tricking one application into sensitive information to another, it exploits the relationship between the application and the computer’s memory — but in the end, the results are the same: compromised data. While Software companies are rolling out patches to help guard against Meltdown, that protection comes at a cost. And in some cases, those patches could make a computer operate slower. Though software patches can prevent some Spectre attacks, it really requires new hardware to be designed and implemented to completely fix the problem. And that means many devices could be vulnerable to Spectre attacks for decades, as devices are upgraded. But don’t let that stop you from installing patches and protecting your data now. That would not be smart. It was our need for speed that got us into this mess in the first place… And good security nearly always comes with a compromise.